Colour: Reddish-brown (as dark as #4, but with a strong auburn reddish hue). The wig was dyed this colour and dyeing it a lighter colour would require first lifting its current colour. Check out our measuring guide for more details. The Yolanda Reddish-Brown Yaki Straight look is a sleek straight wig for those with afro growth hair or extremely curly textures who want a relaxed hair wig. It’s a straight texture with great fluidity and ideal as a wig. It has an undetectable hairline that’s so authentic it will pass for your own hair. As it’s a human hair wig, you can get your curling iron out and make it a curly lace wig whenever you fancy or if you’re not one for heat you can also wet set it for luscious curls and waves after washing. - just wash the yaki straight texture to return. 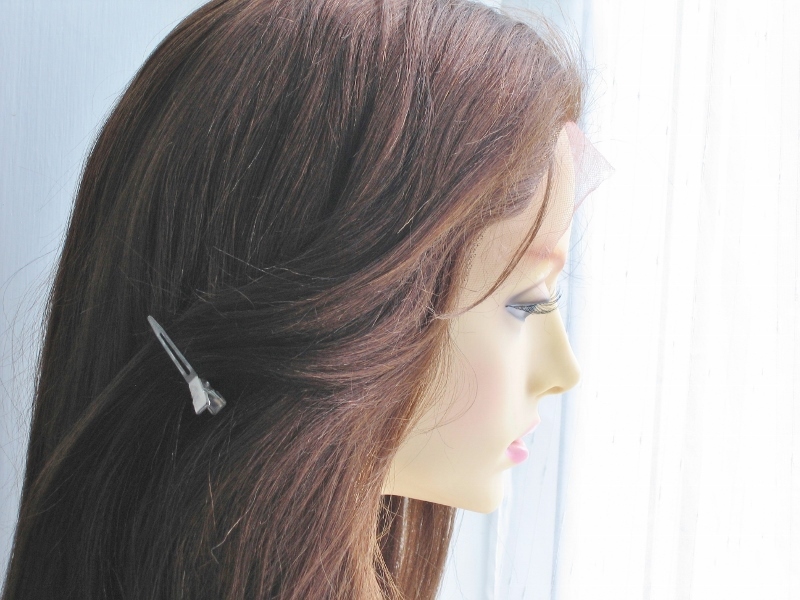 The cap construction of these full lace wigs means they’re adaptable. If you’ve got growth hair you can wear it and if you’ve lost your hair you can wear it – so a great choice all round. The dark colour, suits all skin tones. 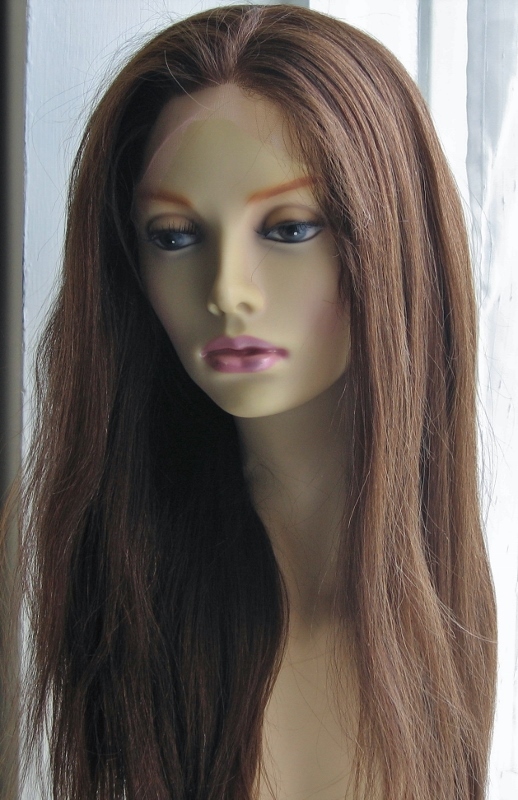 This is a medium length lace wig which works well with oval faces (our wigs by face shape guide has more information). At 18 inches, it’s easily worn by those with rectangular or oblong faces as the medium length won’t add length to the face. Its length along with the free-style parting means that those with square, heart and round shape faces will have the width of the face balanced by the length of the full lace wig and can also add off-centre partings, or side fringes(bangs). 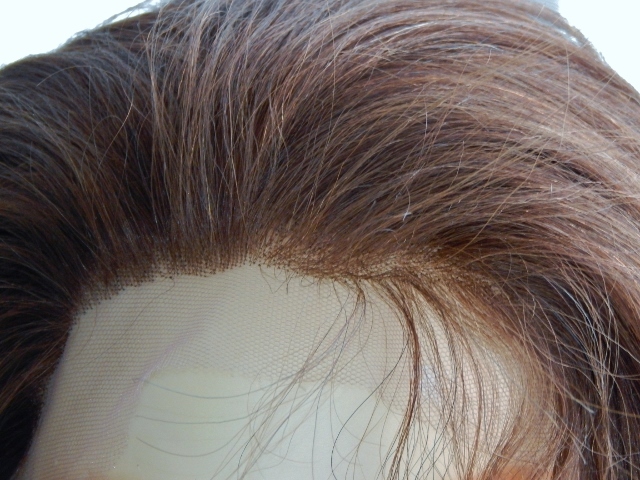 This is a human hair wig that was dyed this colour and upon first washing some dye may run (this is normal) and may soften the colour slightly. The wig was dyed this colour therefore dyeing it a lighter colour would require first lifting its current colour. There are some slightly shorter hairs that are part of the natural weft making process (hair has to be folded to make a weft), this is normal. The colour is multi-tonal for a richer look - this means some strands are slightly darker and some slightly lighter. Items are shipped on Mondays, Wednesdays and Fridays.